These traditional cookies are found in nearly every ethnic celebration. They are also known as sand cookies, butternut cookies, and Mexican wedding cakes. These tender little cookies don't change their shape while they are baking. They are really a shortbread cookie but baked in the shape of a drop cookie. Try forming some of the dough around unwrapped chocolate kisses, maraschino cherries, other types of candy, such as candy bars cut into small cubes, or nuts to form a surprise center. One of my favorite things about these cookies is that the first coating of powdered sugar melts to form a thin icing, which is sealed in by the next coating. So make sure to coat them twice! These cookies are ideal for a cookie tray for entertaining, and they are a must for Christmas or any holiday party. They are mild and tender and crumbly and buttery, just perfect for any taste. Cream the butter with the powdered sugar until well blended and smooth. Beat in the vanilla, then add the flour and salt. Mix just until combined, but don't mix too much. You don't want too much gluten to form; the cookies should be tender. Add the nuts, if using. Cover the dough and chill it for several hours in the refrigerator. We like to make this dough the day before we bake them. When you're ready to bake, let the dough stand at room temperature for about 30 minutes. The dough will be really hard from being chilled. Preheat the oven to 400 F.
Form the dough into 1-inch balls and place on an ungreased cookie sheet. The dough will not spread at all during baking, so you can place them pretty close together. We can usually get all of the cookies onto just two cookie sheets. Bake the cookies for 8 to 12 minutes. The cookies should not brown on the top, or just be very pale gold on the tops, but be lightly golden on the bottom. Immediately take the cookies, one at a time, off the hot cookie sheet and drop into a shallow bowl full of powdered sugar, roll, and place on a rack to cool. 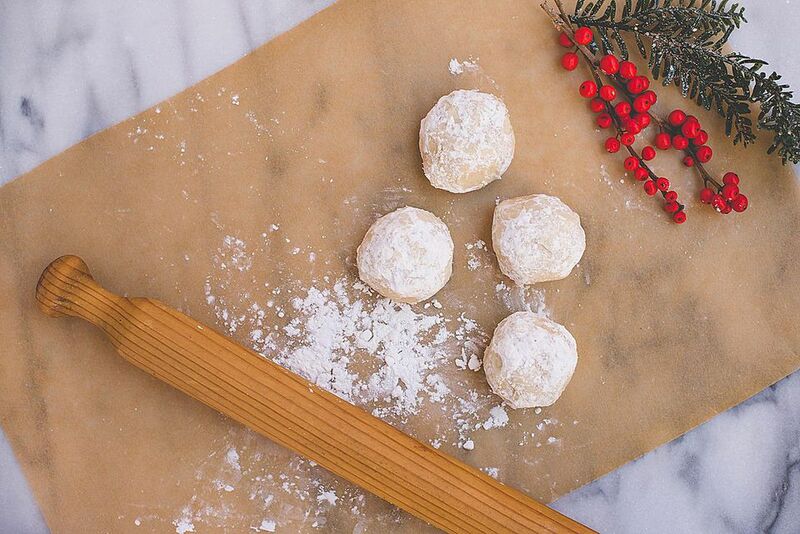 When the cookies are cool, roll them again in powdered sugar to coat. Store in an airtight container at room temperature up to 1 week, if they last that long!